faces as a canvas for their unique and extraordinary art, to more recent times, when black and white met in war and peace. 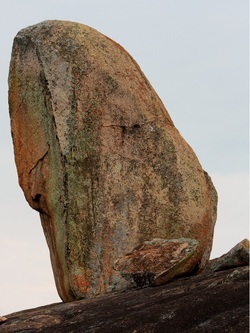 These are the Matobo Hills, located south of Zimbabwe's second largest city, Bulawayo. Forty thousand years ago the caves and crevices carved out of these rocks became home to Zimbabwe’s earliest inhabitants, the "San". Twenty thousand years later "San" artists began painting on the walls of caves and rock shelters, using special pigments and natural minerals that have survived the onslaught of climate and time. Many caves contain superb galleries of Bushman paintings, one of which is Bambata, located no more than 10km from Big Cave Camp. Other Bushman paintings may be seen on the private wilderness in secluded caves and rock shelters. 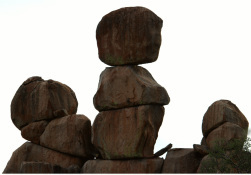 Today the Matobo Hills are a place of peace; however this area is still held in reverential awe by local communities and ceremonies continue to be performed to assist in the making of rain.